THE Gillard government faces days of uncertainty until Kevin Rudd declares whether he will challenge Julia Gillard for the Labor leadership, go to the parliamentary backbench or even resign from his Brisbane seat and force a by-election. As government sources last night revealed the Prime Minister would today call a special caucus meeting for a leadership ballot on Monday, NSW independent Tony Windsor warned it was “more than likely” a change of leader would trigger a return to the polls. And Wayne Swan launched an extraordinary attack on Mr Rudd, saying that “for too long, Kevin Rudd has been putting his own self-interest ahead of the interests of the broader labour movement and the country as a whole, and that needs to stop”. Time’s up. A new election is required. This government has no credibility and no future. Has anyone thought he is considering leaving politics? Now how would that change things in Parliament? DISGUSTING. “Democracy” pinko style. What an absolute disgrace these turds are. 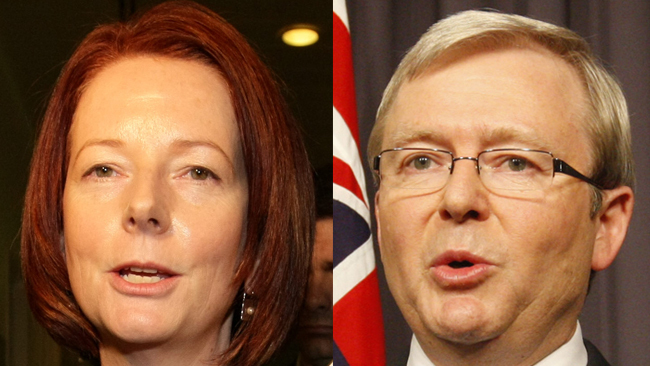 Daughter of Kevin Rudd, Jessica Rudd, may have tweeted, “Effing proud of you, Dad. xxxx,” but I for one am ‘effing’ disgusted that our country is in the hands of such egotistical morons! Are you trying to tell us Jooliar is any better? After all…. one good turn deserves another, doesn’t it? The only hope for Labor is if they find a third candidate who is prepared to defer the carbon tax pending a binding referendum at the next election (together with a written guarantee that the will of the people will be respected). ELECTION NOW please. Does Wayne Swan seriously believe that he and Julia represent “the interests of the broader labour movement” and Kevin not??? Actually, I don’t think any of them represent traditional Labor “values” – so it will be interesting to watch this party tear itself to shreds. No they DON’T. The Labor party is a bloody sellout. Full of Latte sipping Fabian pinko chatterers….. I am sick of the sanctimonious Rudd , but at least I don’t run for the mute button on the remote as I do with Gillard every time she come on the TV. Grant we aren’t all fools and for those who have ever worked in Canberra, the “politics” of this stinks and the staging laughable. Diehard Labor voters will vote Labor even when the candidate is a cabbage. I don’t call them fools, they are blind to the facts and truth. However, restating your stance and then re-calling people fools shows great ignorance and discourtesy to ACM and to us.